At the Farnborough Airshow in July 2014, Aero Vodochody announced the launch of the L-39NG, an upgraded and modernised version of the L-39. 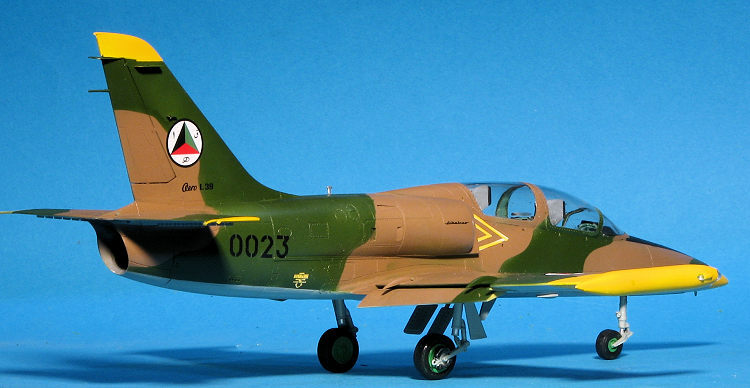 The L-39C trainer aircraft were widely sold as surplus and a considerable number have found homes in the jet war bird market. This is the initial release of this aircraft from two years back. 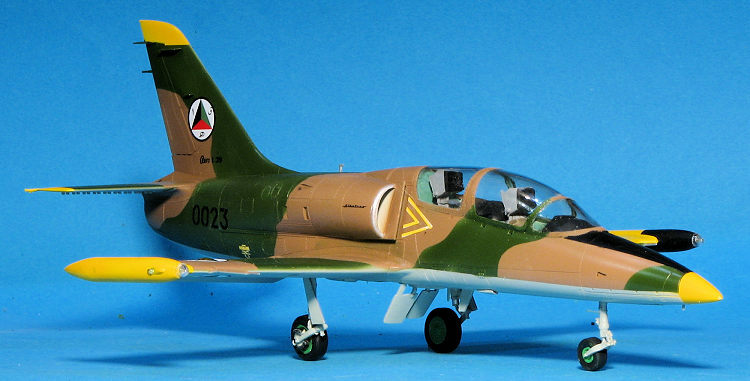 Prior to this we have had, in this scale, the MPM L-39 kit and more recently a version from Special Hobby, this one differing in having an injected plastic clear sprue instead of vacuforme parts. I built the MPM kit and while the end result turned out fairly well, it was a lot of work to reach that point. In fact, it spent some time on the 'shelf of doom' before being completed. Fast forward to the present and we have a modern, non-short run kit of this aircraft from Trumpeter. Typical of 'one mold meets all variants' kits, you will need to open up or close a few holes during construction. It also comes with a photo etch fret as it seems that you cannot get kits nowadays without it. The fret is not all that extensive proving bang seat pull handles, the VOR antennas for the fin, a rudder hinge plate, and some other small bits. The cockpit has two bang seats with belts molded in place. Side consoles have inserts and there are decals to fit atop these and the instrument panels. Rudder pedals and control sticks complete this assembly. 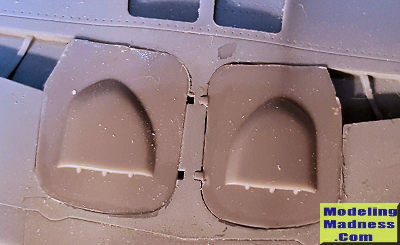 There are small side panel pieces for inside the fuselage halves and once you build up and attach the exhaust and glue in the nose gear well, you can add 10 grams of nose weight and close up the halves. There is absolutely no color information provided for the cockpit or the seat frame. Even the instrument panel has no painting information. A bit of time on the net showed three cockpit colors. One is the blue-green Soviet style, or a dark grey or even one close to the shade of British interior green. Seats were either black or dark grey. The wing is a single lower piece with separate upper halves. There are holes opened in the bottom wing piece for pylons, but no pylons are in the kit so you'll have to fill those. The main gear well fits into the lower half. The kit provides separate flaps and ailerons as well as a separate rudder. Additional cockpit pieces along with the windscreen and canopies are glued on after the airframe is fairly complete. You can pose the canopy sections open if you so wish. Landing gear is well molded and the gear doors have positive locators. You can also model the speed brakes open or closed, though you'll have some trimming to do for the closed position. This is a standard 'learn to fly jets' trainer so the pylons and weapons that come with the L-39ZA kit are not present. Instructions provide a full color painting guide with a variety of paint company options. There is only one scheme but with nine options. The huge decal sheet provides the markings for any one of the Breitling team jets. Most of this plane is in dark blue with silver wing undersides and silver around the cockpit and the top of the jet intakes. The silver areas will also need to be painted as will the black areas around the cockpit. Interestingly, the painting guide shows two aluminum painted tanks, but there are no additional tanks included in the kit and certainly no pylons on which to attach them. The giant decal sheet fills the box and should be fairly straight forward to apply. My past experience with Trumpeter kits has been that while they may have some glitches in terms of shape and decals, one thing that cannot be faulted is their engineering. That means they are a pretty straightforward construct. This one turned out to be just that. The initial thing I did was to paint stuff while still on the sprue, knowing I'd have to do some touch-up at a later date. I picked a medium grey for wells, Soviet cockpit green-blue for the cockpit, a fairly bright green for the wheels, as well as medium grey and khaki for the bang seat. The head rest of the seats were painted in Tamiya's rubber black. This gave me a good start. One thing I do not like about modern kits is a tendency for some companies to have the sprue attachment points on the gluing surface. For me, this invariably means that I end up sanding a bit too much to remove them and it leaves a gap that needs to be filled. Ok, so I then started building up the cockpit. I'm not sure why they bothered with separate side console pieces or the additional small parts for the sidewalls, but they are there. I then attached the decals to the instrument panels. These really do look nice when they are in place and I will always use them instead of painting the dials and such as it is so much easier. It did take two applications of solvent to get them to snuggle down all the way. I then added the control sticks and rudder pedals. The latter were a bit of a shove to get them into the holes. The main panels were glued in and all was left to dry for a bit. Meanwhile I built the exhaust section after painting the parts with Alclad II jet exhaust. This was then glued into the rear fuselage. The nose gear well was attached as was the cockpit. I taped the fuselage halves together while the cement was drying just to be sure there would be no hassles later. Then I cut some pieces of lead and installed that. The instructions call for 10 grams, but I put in 13 just to be sure. I should mention that you can buy sheet lead from a variety of on-line sources and it should last a very long time. It seems more useful than fishing weights as it is denser and can be quite easily molded to fit with a pair of pliers. With all that in place, the fuselage halves were closed. Fit of the fuselage is quite tight so you'll need to tape it closed to prevent gaps. Despite this there is one at the very rear and may well have been caused by sanding sprue stubs. While all that was going on, I assembled the wings and the wheels. Note that the only 'thing under wings', that the trainer version carried was usually fuel tanks. However, these tanks are not supplied with this kit. As Trumpeter uses this basic kit for other variants that do have pylons/weapons, you have four holes to fill on the underside of the wing. I use super glue for this followed quickly by accelerator and sanding. Often takes a couple of applications. I also built up the seats. These are nicely done with pathetically short belts molded in place. I did not paint these as they really are too short and the kit does not include p.e. ones. The central pull handle is photo etch and has to be bent into a V prior to installation. I did not install the seats at this time, preferring to wait until I add the clear bits before painting. With the wings finished, they were attached. A bit of work is needed at the rear wing/fuselage join to deal with a gap. I then installed the rudder with the small photoetch bit atop it and then glued on the tailplanes. These have static dischargers that are very easy to damage so take car. I then dealt with the transparencies. These have a seam down the middle. You can either leave it or sand it off. I did the latter and as usual, was unable to attain its earlier clarity. I'll brush on some future later. I don't dip them as I've found that masks will pull off chunks of this when removed. The instrument panel anti-glare panels had to be clamped in place to fit all the way. The clear parts were masked and th e seats installed. I then attached the clear pieces in the closed position. This will leave some open squares as they are apparently supposed to be modeled open. Also supposed to be modeled open are the large nose wheel door and the inner main gear doors. However, these are only open when undergoing maintenance and during the cycling of the landing gear. To get the nose door to fit closed, the hinges have to but cut away and the remnants sanded/ground down. The door also needs to be shortened a little bit to fit closed. As a note, there is a triangular piece on the nose gear leg that will have to be trimmed down so the gear leg will fit through the small opening that is left. On the inner main gear doors, I cut the hinges on one side and realized that again, I'll have some small rectangular holes to deal with. On the other side I carefully trimmed the hinges, leaving small stubs to fill the holes. These doors are very fiddly to attach closed as there is nothing to hold them up. With all that done, I filled the main gear wells with Silly putty and headed to the paint booth. The decal sheet I'm using has a ton of options on it, making choosing one a difficult task. One thing I knew was that it would have yellow high visibility markings. So I first painted those areas Tamiya white and then Gunze yellow. It was suggested by Rex in TN that I use 100 proof vodka to thin acrylics as straight alcohol (or lacquer thinner in the case of acrylic lacquers) apparently makes things too dry. So I tried it and it really does work well. After that dried, I masked off the bits that were yellow and did the underside. The instructions call for a light grey and gave a Gunze reference for light aircraft grey. This is also FS 16473 in the Testors enamel line so that is what I used. Once that had dried sufficiently to mask, I did so and painted large areas of the upper surface in the color recommended in the instructions. In this case it was FS 34102 dark green. This is a bit lighter than that shown in the instructions, but should work well. Then began several hours of masking the green. 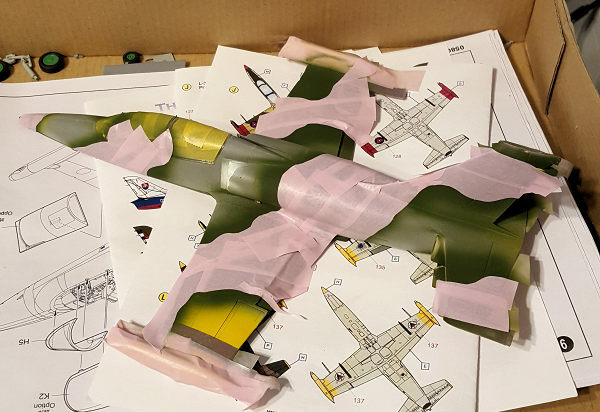 The camouflage on the L-39 is sprayed so tight that it cannot really be duplicated free hand on a model so that is why all the masking. The other upper color is listed as FS 30219. That was then sprayed on. All these colors are Testors Model Master enamels thinned with DYI lacquer thinner. Once all that was done, I had to paint the black areas atop the forward fuselage and the inside of the wing tanks. Before moving on to the decals, there were several antennas that had to be attached. Some are plastic while others are metal. I also glued on the two pitot tubes and then painted all these bits once the cement had dried. A coat or two of Future got the surface glossy enough for decals. I used Armycast decals #48011 for the markings on this one. 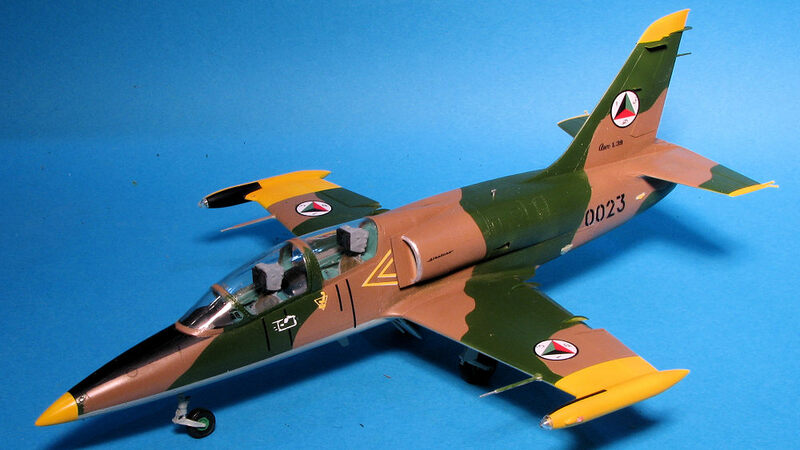 I chose an Afghan Air Force plane from 2008. I did not use the kit sheet for any of the markings because it provided none that were appropriate for a military plane. The Armycast decals are very thin and if they fold over, it is difficult to get them straightened out. There is also a limited time in which they are free enough to move. I used cold water and it took a fair amount of time to where they would start to slide around. Once that level was reached, they had to be applied rather quickly or the glue dissipated and the markings would stick to the backing. They also have you double up with the yellow markings by putting white ones under them first. They did not seem to really need that. After that the wheels were glued on and the main gear doors were attached. A coat of semi-matte clear was sprayed on and the masking remived from the windscreen and canopies. These were then given a coat of future using a Q-tip. Last items were the clear lenses for the side formation lights and the front of the wing tip tanks. I have enjoyed building pretty much every Trumpeter kit I've built. Some of them have their issues, but fit is usually not a major factor. This one builds well and while it does provide a few challenges as I mentioned in the build regarding the gear doors and speed brakes, it makes into a very nice model when you are done. One thing I did notice is that it is a bit wobbly on the landing gear. Not disastrously so, but noticeable. Having said that, I would steer people away from this boxing unless you want to do the Breitling team jet. This is because it does not provide any wing pylons and most of the photos I saw of standard L.39C aircraft had these pylons and fuel tanks. I would spend my funds on the ZA boxing for these bits and you'll have a bunch of weapons that you can add to your stash. Of course, since Trumpeter brain farted the insignia in that boxing, you'll need an aftermarket sheet and while a bit pricey, I recommend the one I used for this build.